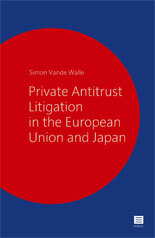 Private Antitrust Litigation in the European Union and Japan. A Comparative Perspective. Companies in Europe and Japan are increasingly the target of private antitrust litigation. These lawsuits are being facilitated by favorable case law, legislative changes and a growing awareness of antitrust remedies in all layers of society. This book analyzes and compares this burgeoning area of litigation in the European Union and Japan. It analyzes the legal framework for these lawsuits and takes stock of the hundreds of cases that have been brought in Japan and the EU in recent years. It also examines the novel contexts in which private litigants are invoking antitrust violations, such as in derivative suits and in actions to challenge arbitral awards. Finally, it assesses the impact of private litigation on the enforcement of antitrust law and shows how Japan’s experience can be useful for Europe and vice versa in shaping future reforms. Simon Vande Walle is a research fellow of the Japan Society for the Promotion of Science at the University of Tokyo. He holds law degrees from Kyushu University (LL.D. ), Georgetown University Law Center (LL.M.) and the University of Leuven (Master of Laws). Previously, he worked as a lawyer at Linklaters in Brussels, where he specialized in litigation and was closely involved in several major private antitrust cases. „Bemerkenswert an der vorliegenden Arbeit sind die profunde Auseinandersetzung mit japanischen Quellen, der klare Aufbau, die gute Lesbarkeit und analytische Prägnanz. Wer ein Vorbild für die Abfassung einer Dissertation zum japanischen Recht sucht, sollte das Buch von Vande Walle zur Hand nehmen“.